At Phones Review we like to bring readers news of useful accessories for their new smartphones, and today we have details of a newly available official Samsung accessory for the Galaxy S4. The Samsung Galaxy S4 Spare Battery Charging System adds to many other accessories for the device, and we have the details you need. One of the benefits of the Samsung Galaxy S4 is its removable battery and also its expandable internal storage via a microSD card. 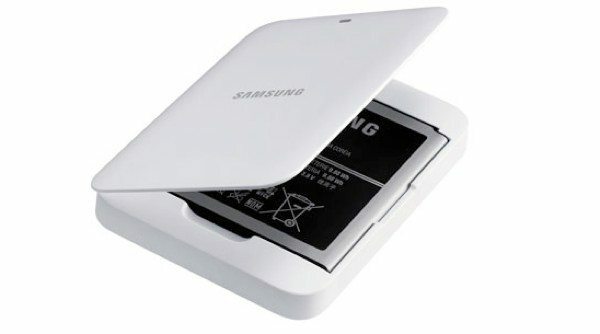 The backside of the device is easy to remove to gain battery access, and so what could be better than an official Samsung spare battery and charger. The charging kit has a spare 2600 mAh battery and charger, as well as a 700mAh travel adapter, and this accessory will give reassurance to those users who worry about their Galaxy S4 running out of battery power at a vital moment. This Samsung accessory also has a convenient compact size. If you want to check out further details or order this Samsung accessory for the Galaxy S4 you can do so at Amazon here, where it’s currently priced at $41.28 including shipping or from Samsung here where the price is $49.99 with a shipping cost of $4. Of course, you are also likely to find this accessory on sale through other online or retail outlets. Would you gain peace of mind from having this official Samsung Galaxy S4 spare battery charging system accessory? Why not let us know with your comments, and while you’re about it tell us if you’re pleased with your Galaxy S4 so far.